How much does a destination wedding at Taj Jal Mahal, Jaipur Cost? Festooned with marvellous forts and palaces, Jaipur is slowly becoming couples gateway to host a palace wedding in Rajasthan! The city is an ideal blend of royalty and urbanity and offers a number of exotic locations to get hitched! And our favourite is the Taj Jal Mahal Palace. This magnificent royal palace is spread across 18 acres of lush Mughlai Gardens and is a perfect venue to host all your nuptial events! Built in 1745 AD, this staggering palace has now been converted into a heritage hotel making your dream of having a palace wedding in Rajasthan true. Falling under the Taj umbrella, the palace strikes the visitors with its refined Saracenic style of architecture, lavish interiors and exquisite venues which are nothing but a bliss for couples to tie the knot. The palace offers the following venues for couples to experience opulence and enter the wedlock royally. 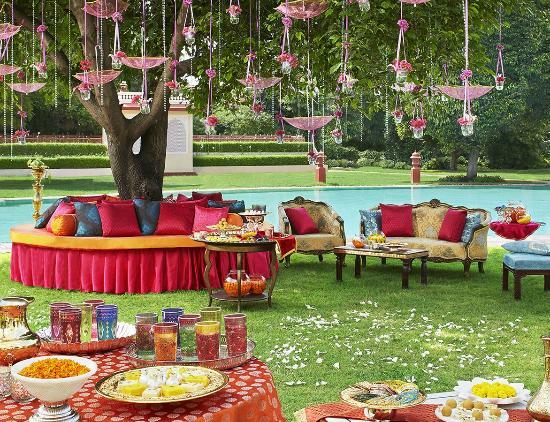 Located in the heart of the city and providing the guests with a luxury of a lifetime with some amazing venues perfect for hosting any sort of events; from pre wedding shoot to cocktails, from Mehndi night to reception, the Taj Jal Mahal Palace is paradise for couples. Accommodation: The palace has 100 plush rooms with 25,000 - 30,000 INR per night. Mandap: Set up your grand mandap according to the theme of your wedding. Aisle: Get a chance to walk down your dreamy aisle in this royal palace. Centerpeices: Elevate the aura of your event by locating majestic centre pieces. Dance Floor: Give your guests a memorable time by arranging for a dance floor where they can groove all night. LEDs: LEDs make everything look pretty and subtle, make sure you use them wisely. Floral Decor: From mandap to stage, daisies and tulips is all you need. PHOTOGRAPHY: Not a weekend warrior, hire a professional photographer to capture your best moments. Keep a track of all the required things for your wedding.